Hey everyone! I'm BR. Yes, that's how people call me. 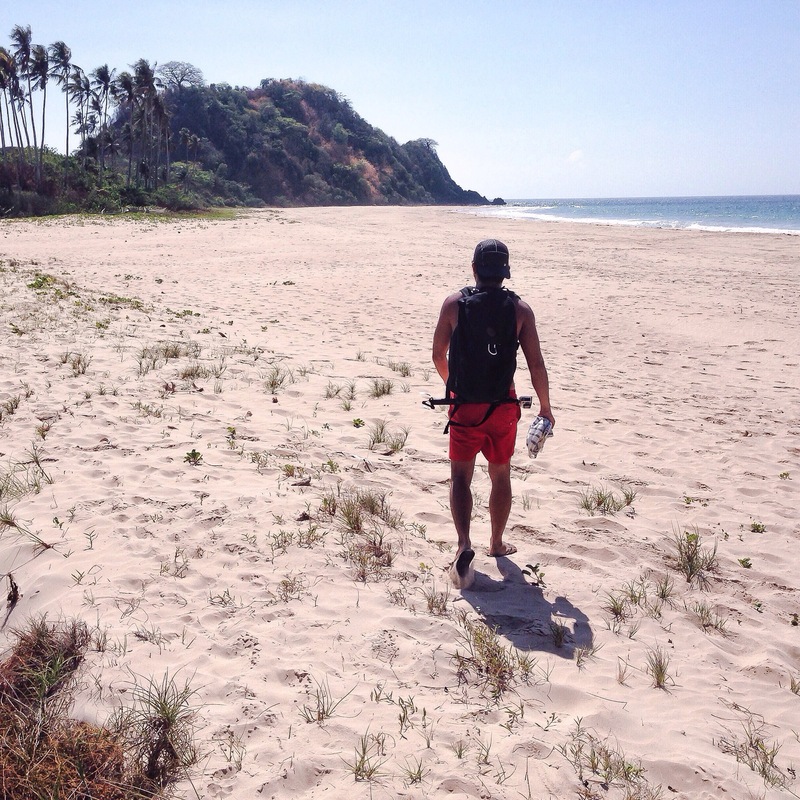 I am a proud Cebuano who constantly seeks great outdoor adventure. I am an impulsive traveler. Solo adventure is my kind of jam but I can be with friends too, even strangers are welcome. Sea, and everything beneath it, is my first love. Then I started climbing mountains and chasing waterfalls. Outdoor is simply everything to me. Who would have thought that the most beautiful island in the world is in Philippines? “This exotic paradise in Southeast Asia has been voted by travelers as the world’s best island – not just once but twice in a row.” Lucy Morris, Mail Online. I definitely agree to that! In fact, I will be taking you to that one place in Palawan which I think a mere representation of its beauty — that is El Nido, a sheer perfection. El Nido is a first class municipality in the province of Palawan. It is situated at northern part of Palawan, or 238 kilometers north-east of Puerto Princesa, Palawan’s capital. The island is most known for its breathtaking views of nature. 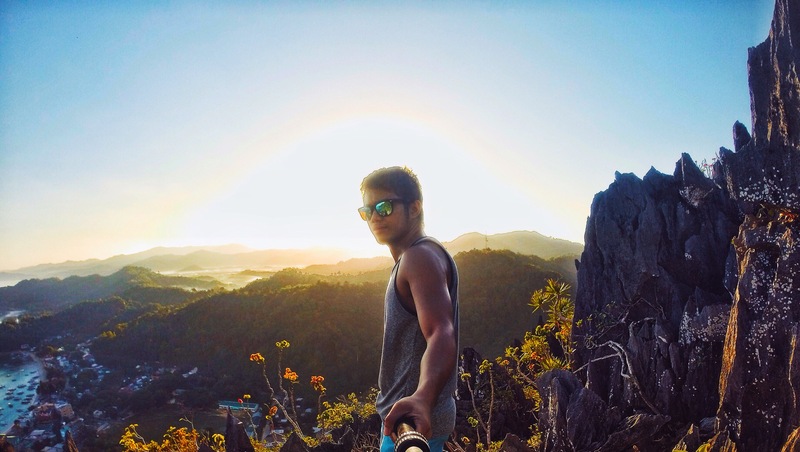 Sunrise on top of the highest point in El Nido. From the airport, there are vans waiting that will take you directly to El Nido. Minimum fare (one way) is 500-600 pesos and the travel time is 5 hours. In my case, I availed the van transfer from the hotel I checked in. It’s 1200 pesos roundtrip. If you want to travel to El Nido from Puerto Princesa Airport at a cheaper cost, you can take the bus that will depart from San Jose Bus Terminal every 2 hours from 4AM to 10PM during the night. This has much longer travel time compared to van, around 6-7 hours. Accommodations in El Nido town are very close to each other. It is pretty easy to find a room that suits your budget and need. So here are some of which I can recommend. NIDO BAY INN – this is where I stayed. 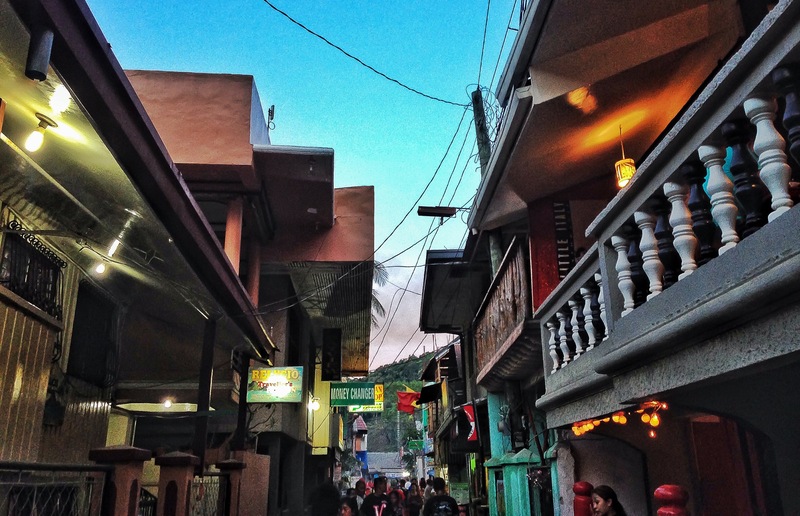 The hotel is situated right at the shore, near Art Café. The room is 1500 pesos per night and good for 2 persons. It also comes with American/Filipino breakfast and free wi-fi. 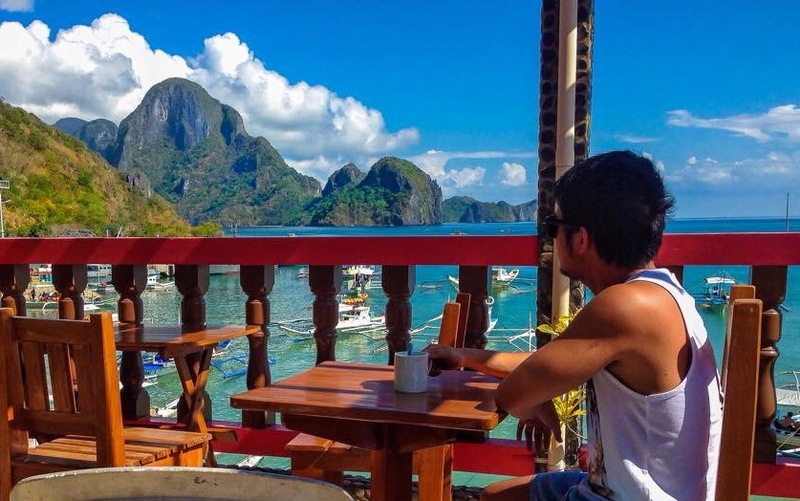 The hotel has a roof deck where you can have a good view of the Bacuit Bay while enjoying your breakfast. LA BANANE HOSTEL – This hostel is the premier destination for backpackers. Yes, this should have been the best place for me to stay in when I visited El Nido. However, it was already fully booked when I called in week prior my travel date. Anyway, you can get a room here that ranges from 300 pesos to 2000 pesos. Cheap right? ANANG BALAY TURISTA – A small friendly place with good air-conditioned rooms. You can get a room for as low as 800 pesos here. This place is near El Nido’s pier. CADLAO RESORT AND RESTAURANT – A cozy place to stay but a bit expensive. 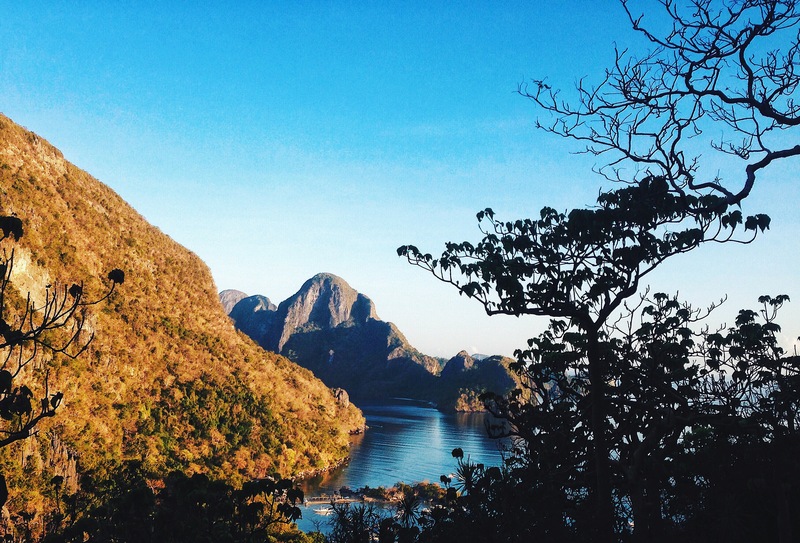 Beautifully located on a trail just outside of El Nido, with a good view over El Nido bay and Cadlao island. Economy room for P5500, and P6500 for aircon room. EL NIDO BEACH HOTEL – Each room and suite is designed with the comfort and convenience of guests in mind. All rooms have hot Water, TV, Mini fridge and free Wi-Fi. P3500-5500. LA SALAGNE – With two different locations, both seafront, La Salangane Hotel offers a variety of accommodations according to the wishes and budgets of its guests. Breakfast on El Nido Inn’s roof deck. The view is breathtaking beauty. You can find a lot of restaurants in the town. Menus have a good variety mostly European, American and Filipino dishes, and prices are moderate. These restaurants are mostly accessible from the laneway, as well as from the beach. If you are on a budget, El Nido has also a lot of Filipino listless eateries that you can find on the main street, for prices around P50 – P70. Here are some of the famous restaurants I can recommend. Art Cafe is a beautiful well established Restaurant with very good food such as seafood, salads, steaks, pizzas, spaghetti, homemade bread, cakes and fruit shakes and very good Coffee. They have Live-Music several nights a week. Free Wifi all day. Travel Center for all your inquiries about your onward travel. The Alternative. Offers tasty & health-conscious food at good prices. Also has a pair of scenic beach-perched “nests” available for dining. Habibi Restaurant & Shisha Cafe. Good food and beverages, and they are the only Shisha Bar in Palawan. Drinks are made with fresh ingredients, pizzas are also popular. The full bar offers all varieties of premium drinks. The vibe is warm and friendly. The place has a lot of activities to offer. If you want an extreme adventure, you can do mountain biking. There are numerous destinations to visit. And there’s rock climbing too if you want to take it to the next level. 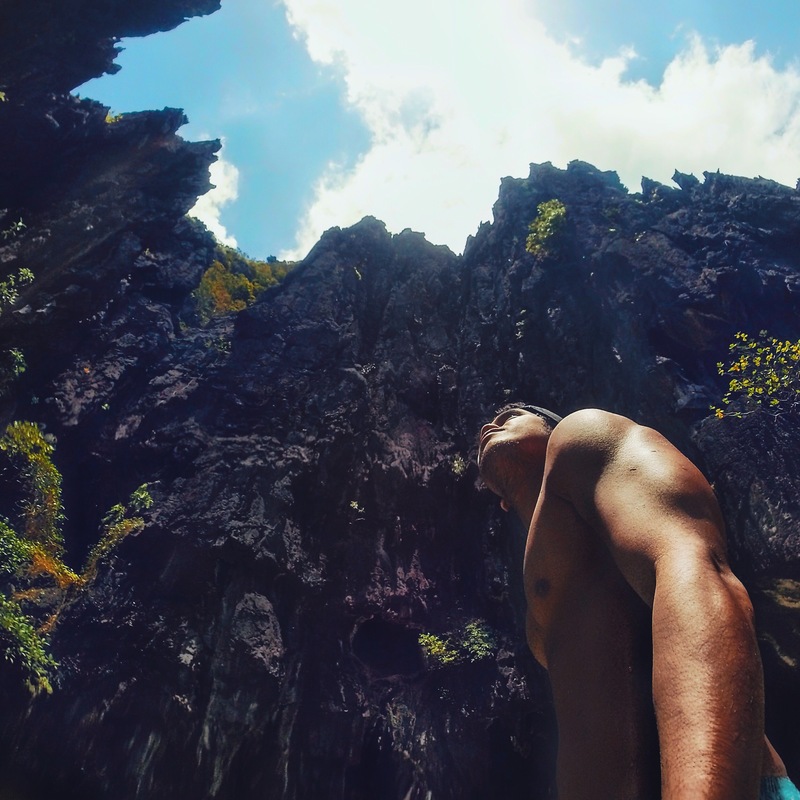 Moreover, I will be highlighting here all the activities I did when I visited El Nido. Climbing the Taraw Peak – Mt. Taraw also known as Taraw Cliff is the highest point in El Nido. Climbing the cliff will not be easy. It is only for the strong-willed individuals who are seeking for an extreme outdoor experience. The climb requires hiring a guide to keep you safe. You can reach the peak for as fast as 30 minutes, depending on your pace. And, you will be climbing on sharp limestones karst so make sure you wear appropriate clothing. The climb will take sweat, bruises or even tears. But it’s all worth it. I tell you. Dramatic view of El Nido Bay. 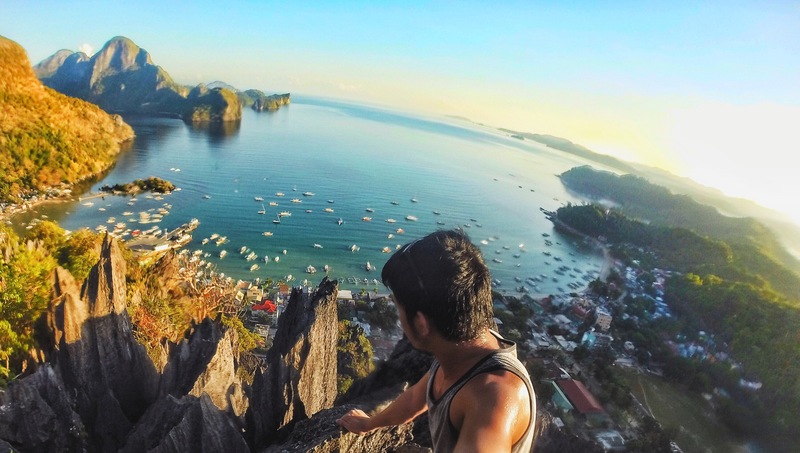 A magnificent view overlooking the whole El Nido. 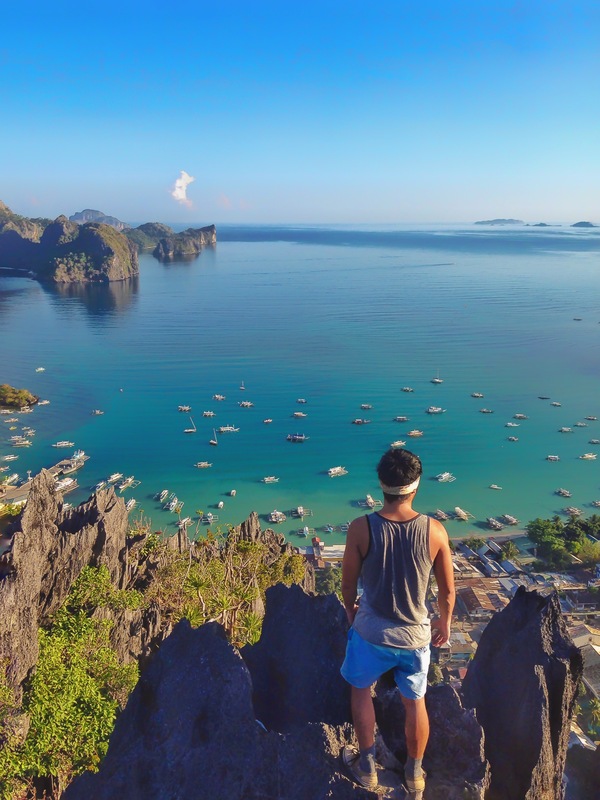 ISLAND HOPPING – El Nido’s paradise is best enjoyed by hopping from one island to another to see white-fine sand beaches, limestones, lagoons and sandbars. There are a lot of island tour packages you can avail in the town at almost the same prices (P1000-P1500 per tour). Tour A is the most famous island tour destination. 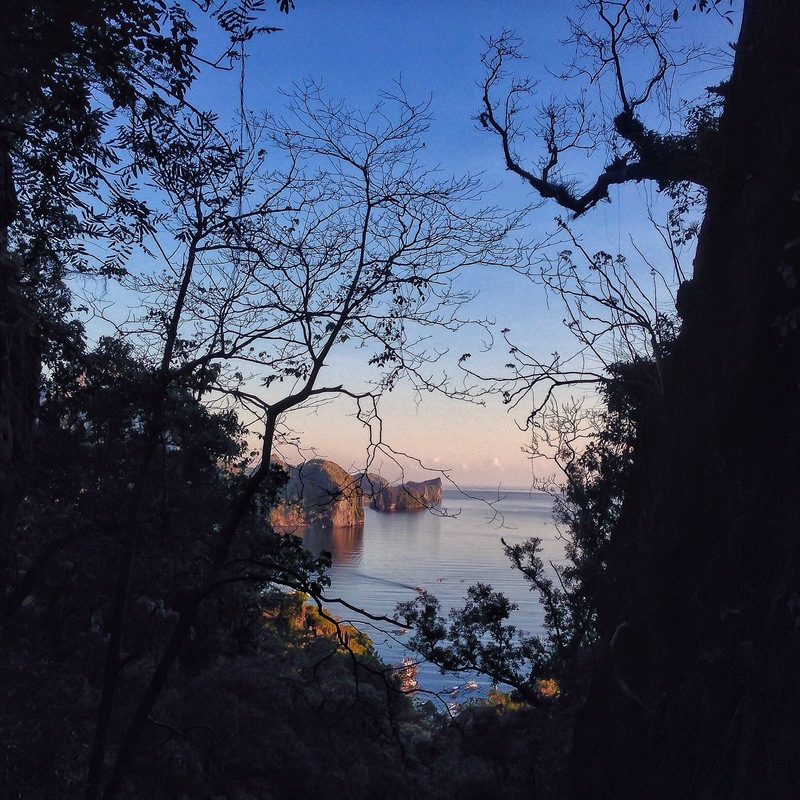 It covers the small and big lagoon, secret lagoon, shimizu island and seven commandos beach. 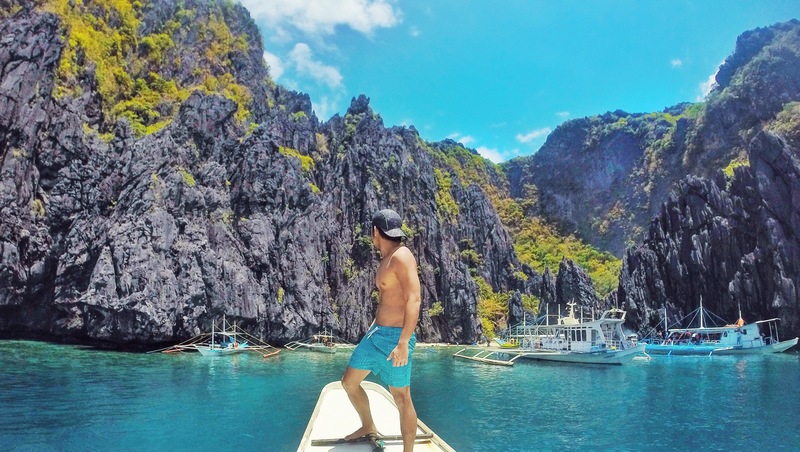 So you better not missed the island hopping when you visit El Nido! Welcome to Big Lagoon everyone! 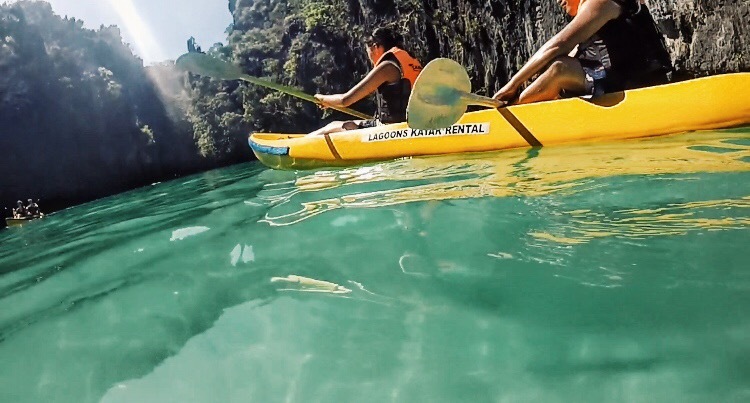 The best way to explore small lagoon is through a kayak. NACPAN BEACH – the beach that I have been wanting to visit again. Situated in Sitio Calitang, approximately 17 kilometers north of El Nido town, the twin beaches of Nacpan and Calitang are prime attractions of the mainland. Going there, you can rent a motorbike for P600 – P800 or you may opt to rent a tricycle for P800-P1000. The beach is a long strip of white sand decorated with coconut trees. 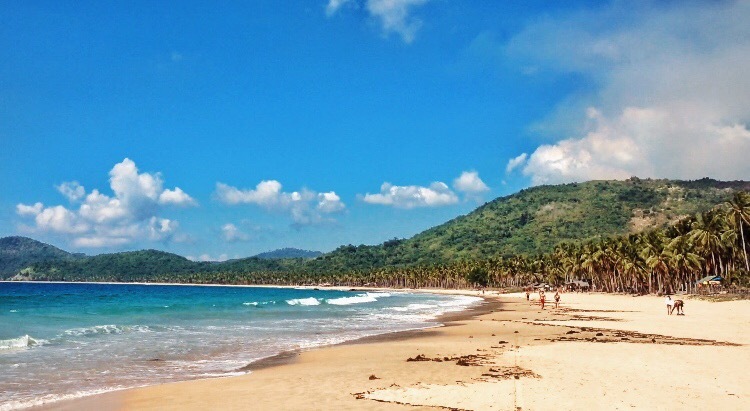 And on the southwest tip of Nacpan is a small hill that will give you a picturesque view of the twin beach. The place is not as crowded as some of the islands in El Nido. Here, you can find a perfect spot to just relax and have peace of mind. You, your book, a bottle of beer, your music or whatever it is and this beach. It’s amazing. I just hope that this paradise will not end up like Boracay. Nacpan Beach showing off its beauty. 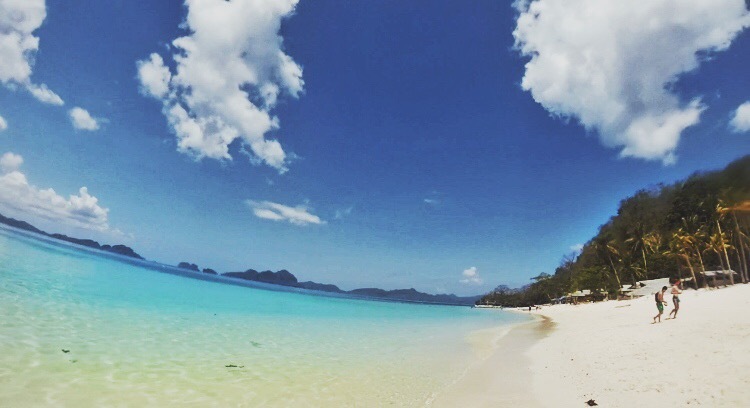 Let’s take a walk on this perfect cream sand. So what are you waiting? 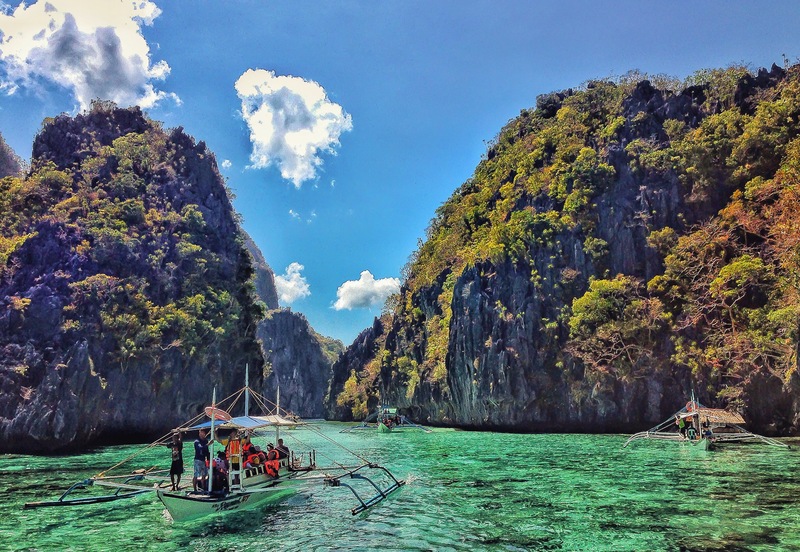 Come and visit El Nido, Palawan in Philippines and have the best days of your life. 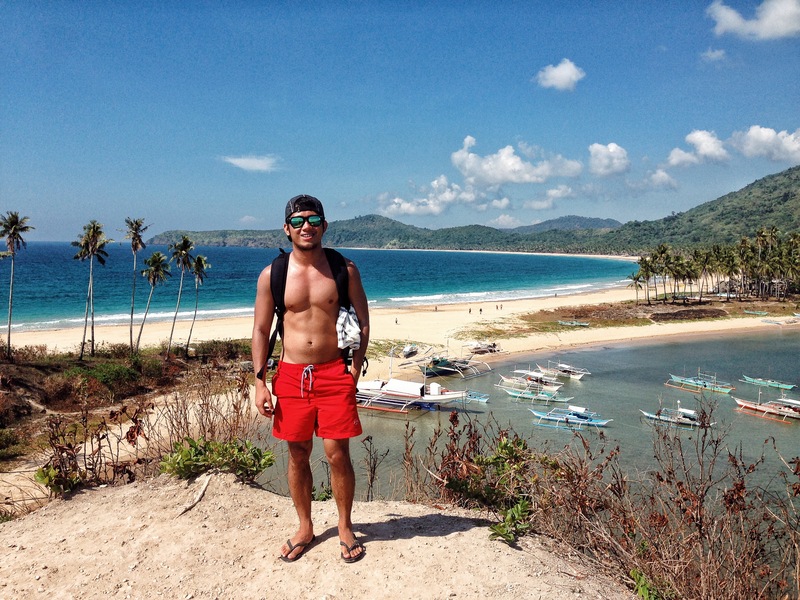 Ur blog makes me want to visit Palawan soon. Very helpful travel guide. Thumbs up again BR!! I’d have to agree. El Nido is definitely one of the most beautiful places I’ve been to.